'Minimalism' is a word we frequently hear used outside the world of the art gallery, and is therefore perhaps more familiar to us than some other art terms. It is often used in discussion about style in general: for example a chic sparse interior with white walls and simple furniture may be described as 'minimalist'. It is also sometimes used in a humorous or disparaging sense to describe something that is less than expected or under par. So, what about 'Minimalism' when applied to art? 'Minimalism' describes a type of abstract art that emerged in the late 1950s when artists such as Frank Stella, whose Black Paintings were exhibited at the Museum of Modern Art in New York in 1959, began to turn away from the gestural art of the previous generation. It flourished in the 1960s and 1970s with Donald Judd, Dan Flavin, Carl Andre, Sol LeWitt and Robert Morris becoming the movement's most important innovators. Art © Donald Judd Foundation/VAGA, New York and DACS, London 2002 We usually think of art as representing an aspect of the real world (a landscape, a person, or even a tin of soup! ); or reflecting an experience such as an emotion or feeling. With Minimalism, no attempt is made to represent an outside reality, the artist wants the viewer to respond only to what is in front of them. The medium, (or material) from which it is made, and the form of the work is the reality. 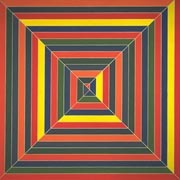 Minimalist painter Frank Stella famously said about his paintings 'What you see is what you see'. They show the extent of what can be done now... The absence of illusionistic space in Stella, for example, makes Abstract Expressionism seem now an inadequate style, makes it appear a compromise with representational art and its meaning. Minimalist artists, such as Judd and Andre, also rejected the notion of the artwork as a unique creation reflecting the personal expression of a gifted individual. They saw the importance bestowed on the hand of the artist in the creation of a work of art as a distraction from the art object itself. Instead they created objects that were as impersonal and neutral as possible, with the aim that the viewer should have a more pure reaction to the art object itself. What are the qualities of Minimalist art? Minimalism sought to de-mystify art, to reveal its most fundamental character, its reality ...Exposing its materials and processes, it attempted to engage the viewer in an immediate, direct and unmediated experience... The work was uncompromisingly radical and challenging: it proposed a new way of looking at the world. Order; it is extremely ordered; purity, because it is perfectly stripped down. But, above all, truth because it doesn't pretend to be anything else. And, like Shelley says, truth is beauty and beauty is truth. Minimalism is characterised by single or repeated geometric forms. It usually takes the form of sculpture or installation, though there are a number of Minimalist painters as well. There is a deliberate lack of expression in Minimalist art, with no trace of emotion or intuitive decision making and thus little about the artist is revealed in the work. Factory-manufactured or shop-bought materials such as bricks or tiles are frequently used as the medium for the work or it is built by skilled workers following the artist's instructions (as with Judd's sculpture). I finally got a very nice timber... So I had carved these things on one face with hollows curving in-out, in-out, very simple really and I set the timber up right and Frank [Stella] came in and came over and looked at the chiselling and so forth and said it looks damn good. And turned around the back of the piece which was uncut, the backside of the timber, and he said you know that's' good sculpture too. But you know I thought to myself yes it is, its really much better than the cut side, you know. The form of the timber was by no ways improved by my cutting into it. And from that time I began to think well the next timbers I get I'm not going to cut... I'm going to use them as cuts in space. Minimal art does not refer to anything beyond its literal presence. The materials used are not worked to suggest something else; colour (if used) is also non-referential, i.e if a dark colour is used, this does not mean the artist is trying to suggest a sombre mood. Minimalist art directly engages with the space it occupies. The sculpture is carefully arranged to emphasise and reveal the architecture of the gallery, often being presented on walls, in corners, or directly onto the floor, encouraging the viewer to be conscious of the space. Simplicity of shape does not necessarily equate with simplicity of experience. Less is More. Minimalist artists did not feel that by paring the work down to simple forms they created a less rich experience for the viewer. Quite the contrary, they believed that they were creating the possibility for a more direct and pure relationship between the viewer and the work. What were the influences on Minimalism? Although radical, and rejecting many of the concerns of the immediately preceding Abstract Expressionist movement, like all art movements Minimalism did not emerge out of nowhere. While Minimalism abandoned the gestural expressionism of the previous generation, the Abstract Expressionists' emphasis on formal qualities, such as the structure of the canvas surface and nature of the medium, over those of representation, paved the way for the Minimalists. Pop Art's embracement of popular culture and use of objects from the everyday, pre-dated the Minimalists interests in the democratisation of the art world, using manufactured objects from the everyday as material for their sculpture. Artists working at the beginning of the century can also be seen to have influenced Minimalist style. The reduction of the artwork to its essential structure and the use of factory production techniques were concerns explored by Russian avant-garde artists in the 1910s and 1920s. With the publication of the first English-language book about the Russian avant-garde in 1962 (Camilla Gray's The Great Experiment in Art: 1863-1922), the work of artists such as Tatlin and Rodchenko became more widely understood. © Tate Archive 2003 Dan Flavin produced a series of works entitled 'Homages to Vladimir Tatlin' (begun in 1964); Robert Morris alludes to Tatlin and Rodchenko in his 'Notes on Sculpture'; and essays by Donald Judd on Malevich and his contemporaries, revealed his growing fascination with this avant-garde legacy. Marcel Duchamp's 'ready-mades', factory produced objects that bore no trace of the artists hand are also seen by many as a precursor of Minimalist art. 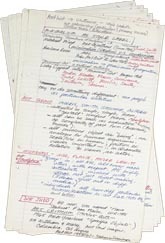 Barbara Reise's notes Minimalism as a Style Label provide us with an interesting contemporary account of the fledgling Minimalist movement, as well as an insight into her ideas about Minimalist art.